Evidently, in Chinese discos around 1999, “Go West” was like “The Final Countdown” in Czech dance clubs. When they played it, everybody hit the dancefloor. However, when you heard the Pet Shop Boys’ cover, you knew it was 12:00 sharp, the start of a new day. 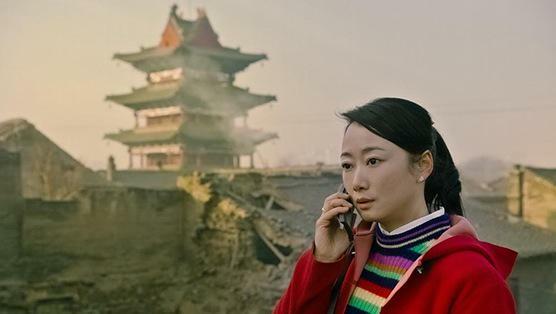 It heralds the dawn of a new era, but not necessarily a better one in Jia Zhangke’s Mountains May Depart (clip here), which screens as a Main Slate selection of the 53rd New York Film Festival. Shen Tao and her friends are going to party like it is 1999, because it is. New Year is approaching, when she will once again sing Fenyang’s big celebratory song. Obviously, the school teacher is the village sweetheart, but the well-heeled wheeler-dealer Zhang Jinsheng and her dirt poor childhood chum Liangzi are particularly smitten. A traditional love triangle forms, but Shen is (perhaps willfully) unaware how dirty Zhang is willing to fight. By most objective measures, she makes the wrong choice and deals with the consequences in the second act set during 2014. Divorced from Zhang, Shen lives a comfortable life as Fenyang’s leading patroness, but it is a lonely existence without her seven year old son Dollar, as his father insisted on naming him, which pretty much tells you what you need to know about Zhang. However, she gets a poignant reminder of what might have been when the long absent Liangzi returns to Fenyang with his family and a nasty case of black lung. The 2014 arc concludes with Shen attempting to make some sort of peace with Dollar before he immigrates to Australia with Zhang and his trophy wife. Flashing forward to 2025, the eighteen year-old can hardly remember his mother. Zhang’s dodgy dealings have caught up with them, causing no end of embarrassment for the son. For obvious Freudian reasons, Dollar explores an ambiguously romantic relationship with his professor Mia, a Hong Kong immigrant (by way of Toronto) who happens to be about Shen’s age. 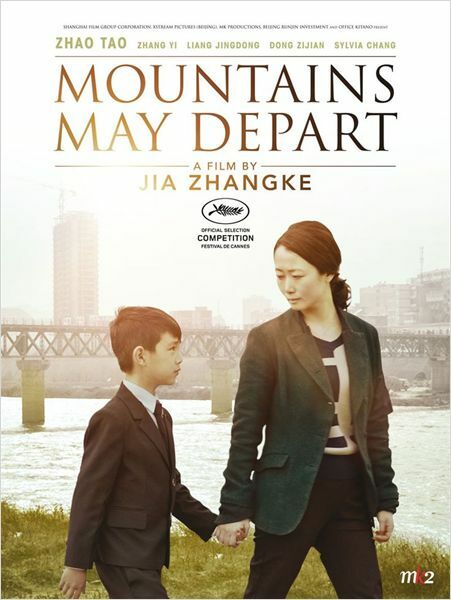 Both the 1999 and 2014 sections include documentary footage Jia shot before knowing they would have a place in Mountains, but not the 2025 segment, at least not as far as we know. Frankly, the opening scene of Jia’s muse and now wife Zhao Tao leading a “Go West” get-down is so infectious, it demanded a film be crafted around. Yet, following its sheer retro joy, the rest of the film down-shifts, maintaining an exquisitely bittersweet vibe. To match his vintage footage, all of the 1999 scenes are in boxy Academy ratio (as per the state of digital cameras at the time) and feature vivid saturated colors (especially the crimson reds of Shen’s wardrobe). In accordance with technological advances and increased pollution, Jia cranks up the 2014 scenes to standard ratio and dilutes the colors, while the 2025 Australian sequences are shot in sterile looking widescreen. You can also notice the population density of the streets and the screen precipitously decline. It is all rather fitting and clever as a commentary on the impact of technology on human relationships, but what really sticks with you is Jia’s characteristic use of pop songs, which has never been as poignant. In addition to The Pet Shop Boys, HK Cantopop superstar Sally Yeh’s love songs rouse all kinds of sentimental and nostalgic feelings, in the way only effective pop tunes can. Zhao Tao is absolutely perfect for Shen Tao. She truly looks ageless and timeless, yet she can eerily convey so much through so such subtle expression. Probably nobody working in film today can hold an audience rapt with a silent close-up as long as she can. Your heart aches for her, but you have to respect Shen for accepting responsibility for her mistakes and carrying on with dignity. Zhao brings more than enough presence for any film, but Mountains also has the revered Sylvia Chang, hot on the heels of Office after a five year absence from film. Few people have her combination of maturity and sensuality that is so aptly suited for Mia. Think of her as a potential HK Helen Mirren, in a few years’ time. There are no end of pitfalls to depicting May-Septemberish relationships, but she develops convincingly imperfect chemistry with Dong Zijian’s Dollar that makes it work in dramatic terms. The more you think about Mountains, the more it gets into your head and your soul. It is the sort of film that might break you out in tears later in the night rather than while you are in the theater, which is rather considerate of it, really. It is also further proof that Zhao Tao is the finest screen actress of our generation, bar none. 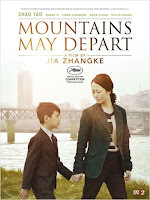 Very highly recommended, Mountains May Depart screens again tonight (9/29) at the Beale Theater, as part of this year’s NYFF.